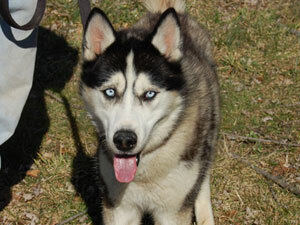 Thunder is a handsome 2 – 3 year old Siberian with shiny bright blue eyes and a tail that wags constantly. He somehow lost his way and found himself being cared for by our friends at the shelter. The staff witnessed Thunder having a seizure and knowing that the shelter was not the best environment for him, they contacted MaPaw. Thunder touched our hearts as soon as we met him and we were happy to bring him into rescue to give him the help he needed. He did have several other seizures and a trip to the vet ruled out a lot of serious possibilities. He was placed on phenobarbital, an effective and inexpensive medicine given twice a day. We are watching Thunder closely and are very optimistic that this sweet guy will stabilize on his medications. Many epileptic dogs lead completely normal lives and the seizures are under control once the medicine is completely in their system, usually 2 – 4 weeks. Thunder is a wonderful Sibe and we are so happy to be here for our bright eye boy. For additional information on canine epilepsy, please visit canine-epilepsy.net.